A few weeks ago I had the distinct pleasure of speaking to 50 ladies at the exclusive women's club, the Verity. 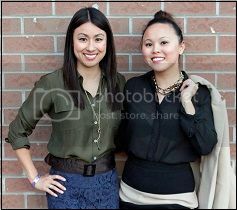 The event, Eco Goddess, was an event Shop Socials co-hosted with DivaGirl Fitness and Fit Your Style. I was charged with dishing up eco style tips for the goddesses that assembled that morning. A bit of a challenge, I originally thought, since I'm not by any means an expert on the environment nor do I maintain any semblance of a strict green lifestyle. Leather will always be on my soles and handbags ladies! I think I'm a lot like most women though. We're concerned and mindful, and sometimes motivated to make the more eco-friendly purchase, but we don't always follow through since we have so many options when buying. What I hadn't considered however, is that it's not just about buying labels with bamboo, hemp or organically produced cotton and here's why: the average American throws away 68 lbs of clothing each year! Yes, the production of clothing (especially our favourite cheap chic poly-blend pieces) can be super harsh on the environment, but the whole concept of fast fashion has us tossing out way too much. With that in mind, my eco chat focused largely about making choices that keep clothing in use and out of landfills, so here are my 3 tips to be stylish while saving the world. In Toronto, we're lucky to have such a rich shopping scene and so many of our boutiques are focused on carrying Canadian and eco-friendly labels like Thieves in Parkdale( a sample of their minimalist fall collection at right). Yes, shopping boutique or organic will be more pricey than Forever 21, but the quality isn't even comparable. Try to think about cost per wear, as in the cost over the lifespan of the piece, instead of just the price on the tag. I can guarantee that if you spend a little more on it, you'll also think twice about throwing it away next season. I know wearing somebody else's shoes -- literally, isn't for everybody. I get it but I still encourage all my hesitant hug's to take on the one gal's trash is the other gal's treasure philosophy and just keep an open mind. Some high end consignment and vintage stores like I Miss You or Fashionably Yours carry mint designer duds that might let you take home Chanel at 3/4 of your paycheque instead of two months rent. Even if you're not cruising for couture, vintage still makes sense, particularly this season, when style is straight out of the 70's. Why buy a polyester bow blouse for $100 when you can get one for $20? I promise you'll be rewarded with that satisfactory "Where'd you get that?". So much of the clothing we no longer wear ends up in landfills if it's not old enough to be considered vintage, or valuable enough to go consignment. If you can't conceive of trying tips one or two, this one is a easy and impactful one. I personally have a standing order with the Diabetes Association Clothesline. Once a month they call and then come pick up any clothing and household items I no longer use. I'm always purging and decluttering and I'm able to do something good without even leaving my house. There are tons of great charities that run clothing drives including Dress For Success and local shelters are always in need. Another idea for recycling that I've been dying to try is a clothing swap. Basically you get all your girlfriends, preferably those with enviable closets, and you play tradsies. If your friends are into what sounds like a fun way to shop or at least play dress up, there's a huge one coming up on October 1st called Uber-Swap in Leslieville. It's only $5 to register and bring your items for the swapping and sounds like a blast. If you make it out, please swipe something cute for me. The racks (shown above) are already colourful. I'm partial to purple so keep that in mind. Image credit: Thieves, Nathalie-Roze & Co.